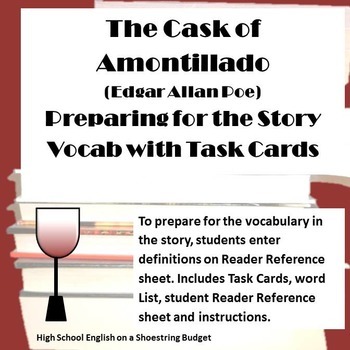 To prepare for the vocabulary in the story "The Cask of Amontillado" by Edgar Allan Poe" students will create a Reader Reference sheet. 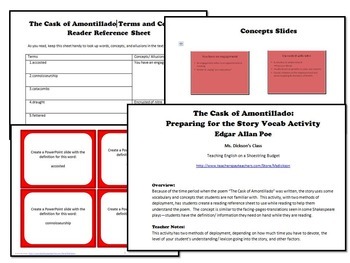 The Reader Reference student sheet allows students the ability to have just the key terms and concepts of the story at hand while they read, making it easier and more likely for them to look up the word. This bundle includes instructions for a whole class project, including task cards to create a PowerPoint slide show with all the terms. It also includes the option to have students work individually on their Reading Reference Sheet. 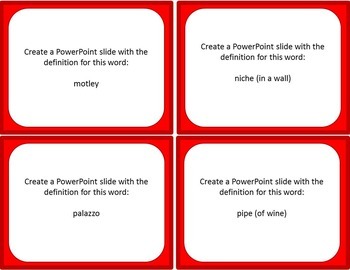 A set of concept terms is included to share with students, either displayed similar to a PowerPoint or otherwise. This item is single file PDF. This item is also included in the Cask of Amontillado Activities Bundle.